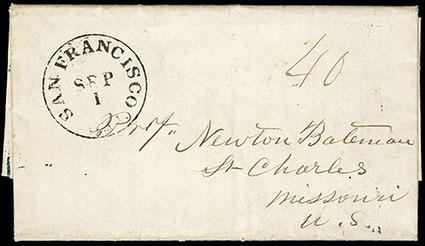 Stockton Aug. 12th 1849, heading on folded letter mailed three weeks later with San Francisco, Cal., Sep 1 large cds and purple manuscript "40" rate marking, letter (2 pages) is from a prospector to his brother back home, letter states in part "I arrived [back] at this place yesterday after a journey of unprecedented toil… some two hundred and fifty miles below with a Detachment of Dragoons who struck for the mountains at a point where the Indians a short time since committed murder on Americans who attempted to penetrate their country for gold at which point it was represented to be very rich and I thought it a good opportunity to get where nobody else could but… owing to it taking more time than was anticipated the animals broke down, we got out of grub, and were forced to return… This place has sprung almost in a day, fourteen ships are lying in the harbor and trade and everything is very brisk… Gold continues to be obtained in about average quantities, but it is now as ever much of a lottery, some make none while others get a fortune in a short time", Extremely Fine, an early miner's letter written nearly a year before Stockton had a Post Office, ex-Kutz. 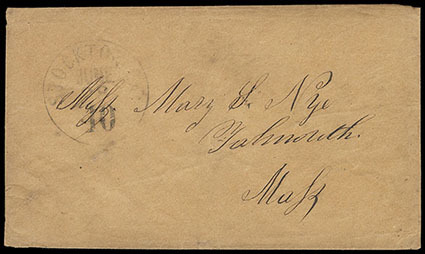 Stockton Cal, Feby 21, manuscript postmark and manuscript "40" rate marking on folded letter to New London, Connecticut, letter (1-½ pages) is headed "Stockton F 5 1850" and from a man to a friend back home with personal content, Extremely Fine, a wonderful example of a Stockton manuscript postmark. 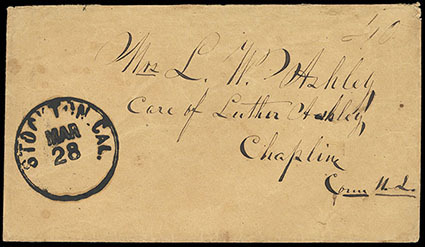 Stockton, Cal., Mar 28, large cds without integral rate and manuscript "40" rate marking on cover to Chaplin, Connecticut "U.S.", undated but necessarily an 1850 use given the postmark type, Very Fine, the only recorded example of this postmark type without integral rate. 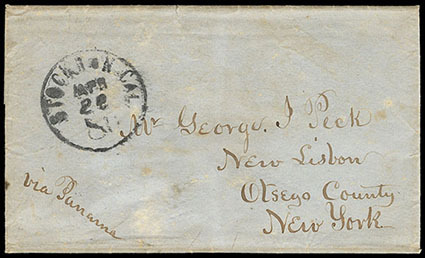 Stockton, Cal., Apr 28 / 80, large cds with integral rate on folded letter sheet (no contents) to New Lisbon, New York, "via Panama" sender's directive, undated but necessarily an 1850 use given the postmark type, bleach spots, short edge tear, F.-V.F., the only recorded example of this postmark type showing the 80¢ double rate. 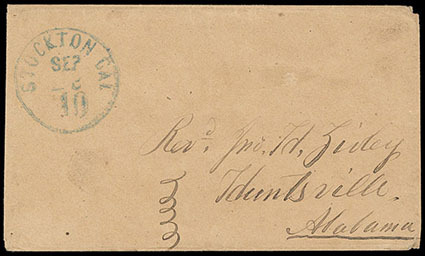 Stockton, Cal., June 28 / 40, large cds with integral rate on cover to Falmouth, Massachusetts, undated but necessarily an 1850 use given the postmark type, F.-V.F., ex-Myerson. 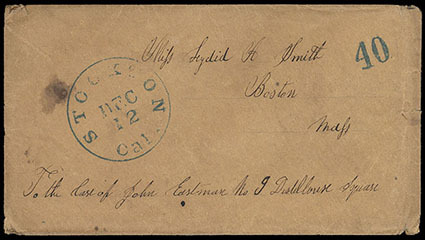 Stockton, Cal., Sep 27 / 40, large cds with integral rate in blue and straightline "Paid" rate handstamp in matching blue on cover to Rochester, Massachusetts, manuscript "Paid" and "R + Co Ex" notations indicating the cover may have been brought in from the mines to Stockton by Reynolds & Co.'s Express, undated but necessarily an 1850 use given the postmark type, Very Fine. 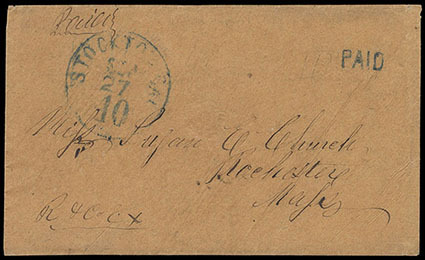 Stockton, Cal., Sep 28 / 40, large cds with integral rate in blue on cover to Huntsville, Alabama, undated but necessarily an 1850 use given the postmark type, minor corner wear, Very Fine. 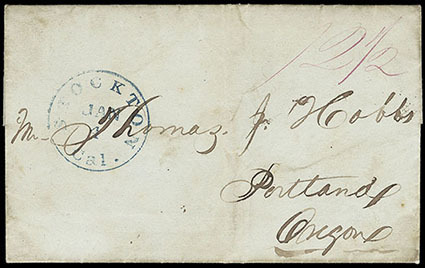 Stockton, Cal., two 1850 covers to Massachusetts, both with blue "Stockton" cds & matching "40" rate handstamp, one with straight line "Paid" handstamp, one is a rebacked cover front, few minor flaws, F.-V.F. 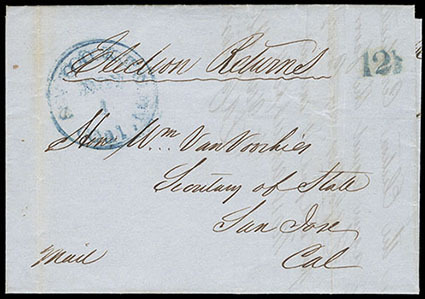 Stockton, Cal., Nov 1, large serifed cds in blue (doubled) and small "12½" rate handstamp in matching blue on folded letter sheet (contents incomplete) to Secretary of State William Van Voorhies in San Jose, "Election Returns" and "Mail" sender's endorsements, affidavit inside indicates election returns from Calaveras County once accompanied, undated but necessarily an 1850 use given the postmark type and rate, Very Fine. 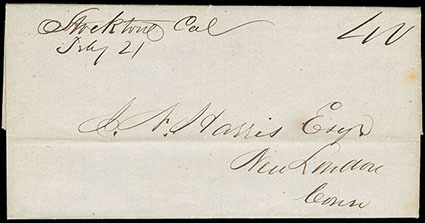 Stockton, Cal., Jan 4, large serifed cds in blue and purple manuscript "12½" rate marking applied in San Francisco on folded letter to Portland, Oregon, letter (1 page) is headed "Stockton Cal, Jany 1st 1851" and from a farmer "on a Rancho five miles from Stockton" to a friend, the writer seeks buckwheat seed in hopes of growing that crop along with barley, lightly soiled, Very Fine and interesting use, not rated by the Stockton postmaster presumably because he was unsure of the correct postage for a letter to Oregon.